You are here: Home / Health / Are Cocker Spaniels Hypoallergenic or Low Shedding Dogs? Are Cocker Spaniels hypoallergenic? Unfortunately, there is no such thing as a completely hypoallergenic dog. All dogs produce allergens in their saliva, fur, and dander, even those that don’t shed as much. All Cocker Spaniels have double coats that shed moderately. They also shed more in shedding seasons. So despite those big, dreamy eyes and long, plush ears, a Cocker might not be the dog for you. Your health matters as much as how adorable this dog is. Although many dog breeds are touted as being hypoallergenic, science tells us another story. What Do We Mean By Hypoallergenic? Are Cocker Spaniels hypoallergenic? Before we can answer, we need to define this term. Hypoallergenic dogs are generally considered to be those who don’t shed, or shed very little. Poodles, Bichon Frise and Maltese are among popular breeds that are often labeled hypoallergenic because they don’t shed as much as most other dogs. So Do They Stop Allergies? It may seem logical that a dog who sheds less would also shed fewer allergens. That’s because it’s not fur that causes allergic reactions; it’s proteins in the dog’s dander, saliva and urine. Unfortunately, there is no dog breed that is 100% hypoallergenic. Although numerous purebred and mixed breed dogs have been advertised as being hypoallergenic, scientific research has shown otherwise. This 2011 study used dust samples collected from homes with hypoallergenic and non-hypoallergenic dogs. Results confirmed that there was no difference in the level of dog allergens. In fact, this 2012 study discovered significantly higher levels of the common dog allergen canis familiaris 1 (Can f 1) in hair and coat samples of hypoallergenic dogs. Do I Need a Hypoallergenic Pet? 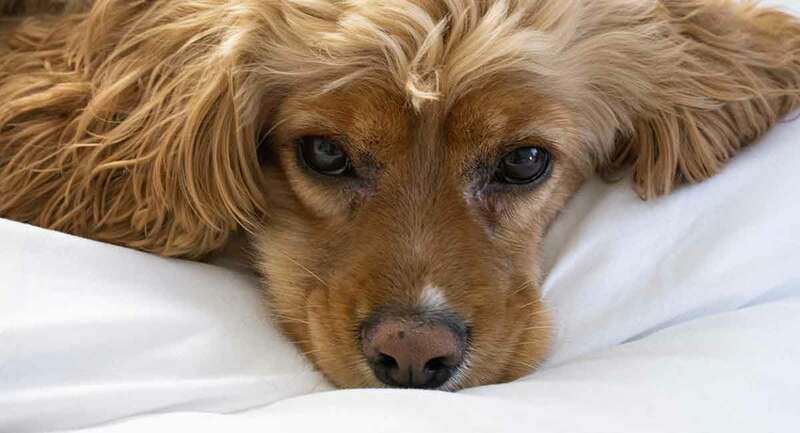 If you suffer from sneezing, watery eyes, coughing fits, a stuffy nose or other pet allergy symptoms, the idea of a hypoallergenic dog may seem like a dream come true. However, when you look at the scientific research, it’s impossible to refute their findings. Don’t despair. Just because you’re allergic to one dog doesn’t mean you’ll have the same adverse reaction to every single canine. Just like people, each dog has her own unique chemistry. And every person’s immune system can be triggered by different allergens. Although Can f 1 is the major pet allergen, there are others, like Can f 2. In fact, there are some that haven’t even been isolated yet. So what this tells us is that when it comes to allergens, it has more to do with the individual dog than any particular breed. You could be allergic to one Cocker Spaniel but have no symptoms at all with another. There’s also a possibility that you can develop an allergy to a dog allergen over time. It’s not even inconceivable for a dog to start producing higher levels of an allergen. If you’re an allergy sufferer, your best bet is to talk to your doctor or allergist before committing to a new pet. They can evaluate your dog-related symptoms and offer the best advice. If required, prescribe medication to treat your symptoms. You may be surprised to learn that the good-natured Cocker Spaniel was originally developed as a hunting breed. This small sporting spaniel stands about 14 to 15 inches and weighs 20 to 30 pounds. With their big, round eyes and upturned nose, the Cocker Spaniel bears one of the canine world’s sweetest expressions. However, it’s their silky coat, which can grow to floor-length, that makes them stand out from the pack. Their feathery, flowing coat comes in a wide array of colors, including black, tan, silver, brown, white and buff, and tri-color. Cocker Spaniels and their striking coats have participated in allergen research. This study found that dog saliva actually has a greater potential as an allergen source than dander. While this one on breed-specific dandruff allergens found Cocker Spaniels to have relatively few protein-stained dander-related antigens. However, the Cocker Spaniel has never been considered a hypoallergenic breed. But what about the mixed breed known as the Cockapoo? A Cockapoo combines the Cocker Spaniel and the Poodle. The low-shedding Poodle is one of the breeds that produces less dander. Although these dogs shed, it’s far less noticeable because the hair tends to get caught in their short, curly fur. You may think that this would create, if not a hypoallergenic breed, at least one who is low-allergy. Cockapoos could potentially shed less than the Cocker Spaniel. However, whenever two different purebred breeds are combined, there’s never a guarantee which parent the puppies will take after. They could inherit their coat from the Poodle or the Cocker Spaniel, or it could be a unique blending of both. Are Cocker Spaniels Low Shedding? So, we’ve answered the question ‘are Cocker Spaniels hypoallergic?’, but are they low shedding? Cocker Spaniels have a double coat that consists of medium to long silky hairs on top with a soft undercoat beneath. When it comes to shedding, some will lose more hair than others. But all Cocker Spaniels will shed at least moderately. Many people who don’t have show dogs choose to trim their long coat. However, even if you go this route, they will still shed. Throughout shedding seasons in the spring and fall, expect the Cocker Spaniel to shed even more. They will require daily brushing to remove excess hair during these periods. Just as there are no hypoallergenic dogs, there are also no non-shedding breeds. All dogs shed to some degree. Shedding is a natural process in which dogs dispose of old or damaged hairs. However, the amount they shed can vary greatly from breed to breed. Double-coated dogs like the Cocker Spaniel typically shed more than those with a single coat. Most dogs will shed a great deal more during the spring and fall shedding seasons. This is due to hormonal changes, which are affected by the increase or decrease in daylight hours. In the spring, the Cocker Spaniel will shed her heavy undercoat that keeps her warm during the winter. However, there are also a number of health-related reasons why a Cocker Spaniel could be losing excess hair that you should know about. What About When Dogs Shed Excessively? Cocker Spaniels are prone to skin issues, and this could lead to hair loss. Aging Cocker Spaniels are susceptible to hypothyroidism, which can also result in fur deficiency. These people-loving dogs can get very attached to their families. Separation anxiety is another reason your Cocker Spaniel could be losing more hair than she should be. Both food allergies and lack of a proper diet could also be the cause. It’s best to seek veterinary advice if you suspect your dog is losing more hair than normal. Whether you choose to let your Cocker Spaniel’s silky coat grow to floor-length or opt to have it cut, she’ll need fairly intensive grooming. The former will require daily brushing to keep her coat from getting tangled and matted. If her coat is trimmed, grooming sessions every three days should suffice. That is unless she’s gotten into something messy or it happens to be shedding season. Use the proper tools like a slicker brush to get rid of loose hair. If you encounter any snarls or tangles, use your fingers to pick them apart. Their ears in particular are delicate because the skin at the edges is very thin. The Cocker Spaniel is a breed who requires regular bathing. Using a high-quality dog shampoo is important, as is rinsing and re-rinsing thoroughly. Soap residue can cause skin irritation and damage their silky coat. Dry them carefully with a blow-dryer on a low setting. Their ears especially will need to be dried carefully after bathing because Cocker Spaniels are also prone to ear infections. Since this breed is susceptible to skin issues, after bathing is a good time to check for any inflamed spots. Some owners choose to go to professional groomers to keep their Cocker Spaniels’ coats looking their best. If you choose to do it yourself, this article will give you more detailed information about grooming a Cocker Spaniel. In addition to regular grooming and bathing, there are other ways to reduce the allergens a dog releases into your environment. Regularly wash dog beds, blankets and plush toys with hot water. Needless to say, don’t allow them to sleep in your bed. Otherwise your own bedding will be coated with their hair, dander and saliva. Regularly dusting hard surfaces and cleaning carpets can reduce the amount of airborne allergens in the home. It may also be beneficial to get rid of old carpeting and heavy curtains, which can trap dander. High efficiency particulate arresting (HEPA) air filters have proven to significantly minimize the amount of airborne allergens in homes with dogs. If you’re looking for a low allergy pet, the Cocker Spaniel may not be the ideal choice for you. Their beautiful double coat sheds regularly and requires routine grooming. Although there is no dog that’s completely hypoallergenic, there are some breeds who are considered low shedders. When dogs lose less hair and release less dander into the environment, it can reduce your allergy symptoms. But even this is no guarantee it won’t trigger symptoms. Dogs who are considered low shedders range in size from the Toy Poodle to the Giant Schnauzer, with lots of variations in between. A Cockapoo whose coat more closely resembles the Poodle parent may also be a better option for you. Summary: Are Cocker Spaniels Hypoallergenic? It’s important to remember that not everyone who is allergic to dogs will react to the same dog allergens. And not all dogs produce the same amount of allergens. It all comes down to chemistry. It’s entirely possible to have allergic reactions to a dog who’s deemed hypoallergenic. However, a dog who triggers your particular allergies may not bother someone else’s. If you suffer from allergies, the best way to choose a dog is to spend lots of time with her before bringing her own home for good. In fact, everyone in your family should hang out with the dog beforehand to ensure that they’re compatible and will be able to live happily together. Are you a Cocker Spaniel owner who has found a way to keep your allergy symptoms at bay? We’d love to hear about your experience in the comment section below.